I started admiring Mike Bartick’s images pretty soon after getting into underwater photography. I was in love with macro and just becoming aware of snoots, and Mike was one of the masters of macro that I looked up to. Over the next few years, Mike became especially renowned as a blackwater specialist and I followed his articles and the Facebook Blackwater group with great curiosity. I finally had the opportunity to meet the man in person whilst staying at his resort, Crystal Blue, for the Anilao Shootout. Mike’s booming voice and cackle are hard to miss and he never misses an opportunity for a joke - even if it means shouting over water from one bangka to another! His relaxed, Californian attitude almost disguises the tremendous love he has for diving, photography and the undersea world. Unlike most dive resort GMs, Mike dives pretty much everyday, for as long as possible and, as this series of conversations with great underwater photographers continues, the unifying quality seems to be their unusual degree of passion for being in the water. You can listen or read our conversation below (apologies for the loud background noises on the audio file, Mike’s staff were setting up for a big workshop in the room above). Henley Spiers: All right, this is Henley Spiers and I am here with the great small animal master: Mike Bartick! A photographer I have admired for a few years now and we're at Crystal Blue, his resort. We are just waiting to hear the Anilao Shoot-out results so fingers crossed and we thought we'd take this opportunity to have a little chat about Mike's life in underwater photography and outside. Mike usually at this point, I ask what came first: underwater photography or diving, but you've been talking about cooking school...so was cooking your first passion? Mike Bartick: Well that was the first job I had to get. According to my dad, I had to get a job when I was in my late teens. So I pursued cooking school and I loved that. I still like to cook but after 20 years of being a chef I decided to step away and follow a different passion. I've always loved diving and photography and it became a choice where I had to do only really one or the other. And of course, you have to make quality choices, like I did. Henley Spiers: So you were diving and shooting whilst you were a chef? Mike Bartick: Correct yeah. You know when you're a chef, it's a high pressure situation. So. I worked with a guy who used to dive frequently and our kitchen was right near the ocean in Southern California. And he would dive in the mornings and we'd meet at work. He was the chef that I mentored under, and he really encouraged me to try to try things, including scuba diving. I had dove when I was younger. But. I never really did it, you know, as an adult, with an income to have the opportunity go as much or as often as I wanted to. Mike Bartick: Yeah already had a camera so…Basically, I had camera that I borrowed from a friend when I was about 15. It's a little Olympus...I think it was called the Olympus sport, this little yellow one-ten Instamatic, and it was designed for snorkelling and hiking and that kind of thing, and I would take it on family vacations. I think I might have been 15 or even younger...14. So I would take it and you know I'd snorkel all over the place, Hawaii…wherever my parents used to go to tropical destinations for vacations, and that's when I started shooting. But of course there's a huge disconnection in the photos that you shot then! I would breath hold, take a photo, and then you send a film to get the photos made and then you get them back. and you're like “wait a minute! You guys sure these are the photos I took? !” So it was pretty bad. I was lucky to actually get anything in the frame. So yeah I've always had a camera. I've always had a camera when I dove. So when I started diving as an adult later on I did a couple of dives with a friend who signed me off for my certification and then I bought a camera like in the same week. Henley Spiers: So going back to that time where you decided okay, I love cooking but I love diving and underwater photography more and I want to make that my full time gig. What was the goal? Did you want to work as a dive pro, or did you want to work as a photo pro? What was your plan at that stage? Mike Bartick: Well you know you always think “ohhh I'll be a…”…You see this is what happens: you win a contest, you get published and you think “oh I found my calling!”, and I've heard it happen many times, people quit their day jobs and. pursue it. Well I had a mentor and he stressed to me: don’t quit your day job. And I Listened to him. So I pursued both. And I dove as much as I could shooting photos. I got a side job writing for a local magazine in California called California Diver News and was getting published in that pretty regularly. Then started traveling, started working with websites, and getting published, and I was in Indonesia and a friend of mine said hey you should check out Anilao. So I did. I came here in 2006 and was just blown away by. everything, such a beautiful place. And so I guess I started to do workshops in about 2009 and I thought, you know, there's room because only Alex mustard was doing workshops at that time. He’s a guy that I've always looked up to as a shooter and a super nice guy too. So I thought, if I could do a couple of these group trips/workshops then maybe I'll be able to do a little more travel. and try to monetise it. So that's where I started: bringing people to the Philippines and, you know, traveling back and forth at the end of the day you’re broke, you don't have anything. Yeah, so there were a lot of. learning curves just like in any business and it was about 2011 before I came to Crystal Blue and met with the owner and we had some long discussions and figured out…First, I wanted to find a home base that I could work with, and at that time Cathy Church had this big thing down in the Caribbean, and I thought “oh we could do like a Cathy church kind of place”. But the thing was I wasn't very confident about my shooting skills and "who's this guy" you know, who's going to want to take any kind of photo lessons from him. So I was really apprehensive about that so I really concentrated again back on what I learned, which is the service industry of being a chef. And together with the owner, my business partner Emma, we decided to turn the resort into the first. dedicated underwater photographers resort in Anilao, and build it up, and we did that. I just concentrated on the natural history of the area because I wanted to create an experience for guests. I've always enjoyed having an experience on a vacation. When I look back I always remember the trips I had these great experiences on. So I wanted to provide that to people, and started running a big group called Critterfest, and started building it up from there. And a good friend of mine, Scott Geitler at Bluewater photo, he started bringing groups and then I sort of branched out bringing in agents, and the resort started to take shape on its own. And you know it's been about seven years now. Henley Spiers: And back then Anilao was not really on the dive map - is that fair? Mike Bartick: Not really, when I first started coming here nobody had heard of it. And if you tried to find it on the internet you couldn't. I mean it was just like, yeah it exists, but how do you get any information? And the speed of business even still today, the speed of business here is really island time. So that was one of the things that we established, was communications, fast response, you know bringing in a North American idea of how to do business to the Philippines. It was quite different. So you know I really don't like to say that I'm the one that put the area on the map because that's not really true. People will point fingers and say “yeah you're the guy"... but no, that's not true. It's just the right place at the right time. And you know this place was ready to explode with popularity at that time, and has always been popular, but it just didn't have the infrastructure and somebody behind it pushing it. And when I started coming here and doing that I got a lot of people angry at me for making articles and writing and posting and talking about it. There's a lot of. shooters out there that were very protective of Anilao, and I got a lot of dirty emails. Mike Bartick: Yeah...a lot dirty e-mails for it. So it was quite a different culture. A lot different than it is today. Mike Bartick: You know I think about that a lot on some days, when I'm at a dive site and you look around and you think “Wow. How did this happen? !” but you just can't keep it down. It's one of those things where you can't control it and sometimes you wish well, I wish I would have just kept my mouth shut. But if it wasn't me somebody else would have come along and you know I'm really happy to be a part of the forefront of the wave of people that came here. I think that more can be done from the local governments to make it a more sustainable area. A lot has been achieved from their end over the years. People have been diving Anilao for 40, 50 years. So. you know, again, I'm not the first person to ever dive here. Henley Spiers: Do you feel like there's this huge momentum behind macro diving these days? Henley Spiers: But what are your concerns around the trends in macro photography where it's going on. What are your worries and do you have any ideas of solutions to those? Mike Bartick: You mean worries for this area or in general? Mike Bartick: Well I don't really worry about that. What I do worry about is impact on our immediate area here. Places like Anilao, Lembeh, Ambon, that have a lot of divers that are on the substrate all the time and destroying habitat and things of that nature. But I don't think that the human impact is as great as what we're seeing from weather anomalies it changes in the end, or mooring and anchoring practices. So you know, some people say “oh you're handling the subjects” or “you're touching the corals” you know, but that’s just a fraction of what's actually occurring from weather and from these other poor practices. I think as photographers we need to be also custodians of how we should behave underwater and try to carry that to the local communities. Henley Spiers: And when did you start trying blackwater diving? Mike Bartick: Blackwater diving…I started doing that as blue water diving in California. Off the coast California, with my buddies, and we would motor out about 10 miles offshore and jump in and drift. And at that time we'd connect ourselves to the boat, you get down to about 80 feet and it's almost pitch black. California, the way that the sun hits the water, even at noon, unless you have super stellar visibility, the water's really dark. So it wasn't blackwater diving by any stretch of the imagination but when you get down that deep in California there's this train of plankton that's just moving along and you could get down there and you could shoot photos of it, it was amazing. So I started doing that, probably about 10 years ago and continued, I think my first actual blackwater dive was about 2012. I remember 2012 because I has a photo of a larval flounder. Henley Spiers: That was your first blackwater photo? Mike Bartick: Yeah, for blackwater, and I thought it was…I didn't know what it was. I thought it was you know just... I knew it was a flat fish but I didn't know that…I had no idea about fish settling from the plankton at that time, and the whole lifecycle of fish. So I thought that…you know these crazy things...Anyway. Henley Spiers: So this was in Anilao or this was in California? Mike Bartick: Tell you the truth I cannot remember. It was one of the two. But we never did blackwater diving formally California. We do now. So chances are it had to be here. Mike Bartick: Yeah kind of, but never really pursued, yeah never really pursued. Still shooting open blue water. You know, I love that experience, to be free. The freedom of being in the open ocean, three hundred and sixty degree environment. I love that. You get that a lot California. You have to swim back to the dive boats in open water. The boat doesn't come to get you. So if you're not comfortable in open water in California, then you're not going to be a strong diver, so you get over that soon when you're there. But it was my buddy I have to say, Gutsy, that started posting a lot of photos and right when he started posting them, he was working on one of his books, and Gutsy and I have been friends for a long time so we started doing blackwater here. I had already started doing blackwater with some friends here, California friends, and you know I had mixed experiences. It was probably about 2014, when we started doing that, and you know we have a lot, a lot of bad stories. Nobody died thank God but a couple of hairy stories. But Scotty and I would go out dive when my buddies were here and we got to know each other and diving and shooting more and having more experience. And then I realised, you know I love to inspire people to try things so I I realised if I want our guests to have that same experience, I needed to devise a way where I can do it safely. Mike Bartick: We would tie off. First, I took a long rope and tied it to the balancer on the boat and then jumped in. And you know, you're in the water for about five seconds or so when you realize the boat has been blown off by the wind. And there you are in pitch black water. So we're like “this isn't gonna work”. So we tried putting a sea anchor on the boat and more lights - that didn't slow it down. We tried multiple, multiple things, finally we came up with the system we have now with the buoy. And that's just really the best - unaffected by wind, you can really dive at a slow, even pace and really enjoy it. Henley Spiers: Do you think blackwater is something which is open to everyone? Mike Bartick: I think everybody should try it. I don't know if everybody's qualified for it. I think if a diver has strong dive skills and they want to try it, they should but just to make sure that they're with an operation like ours Crystal Blue (plug!) that's reliable and has the experience doing it. There's a couple of places in the world that does it. Like Kona, they really inspired me as well. But the way they do it is different. You tether in, you tether off to their thing. So that ensures safety right. We don't do that, but the downline is strong enough and stable enough for the guests to hang onto the line if they don't feel comfortable. So I've had guests well into their 70s do it and enjoy it. Henley Spiers: Is there a subject you're chasing right now in the blackwater environment? Mike Bartick: I would really like to see another blanket octopus, but I want to see it open its blanket. I've had two encounters and one was with this giant female that had eggs. Probably the only one, myself and another guest, probably the only ones on the planet that have seen that behaviour. It was about one meter, about a three foot octopus, ot counting the blanket which is huge. It looked like a ray it was so big and it wouldn't open its blanket. So I would like to have that opportunity again and shoot it. I love seeing the behaviour of this stuff. Henley Spiers: Blackwater is super cool, super fashionable now. Henley Spiers: Do you see it just continuing to grow and grow in popularity? Mike Bartick: Absolutely. I've done a lot of talks on it and I've written several articles since the first article that I wrote on it. You know there was a few handfuls of people that were doing it but that's it. Myself and Gutsy we were doing it out here at the resort. They're doing it in Florida and in Kona, and I never heard of anybody else doing it. So I really wanted our guests to have the experience like I said and half the stuff I didn't know what we're shooting. No idea. So I started a Facebook page: the blackwater photo group. And that was just to share information in hope that I would get a couple of scientists on there and me and my friends could share our posts and pictures and kind of make each other jealous, and drive each other. And that forum has grown from like twelve people to over 4000 in a very short period time. And I see it really gaining more popularity as time goes on and more people try it everywhere. Henley Spiers: I think some people would say, maybe in part because of that group, that you were the father of Blackwater..
Mike Bartick: Yeah I do have a lot of people…and maybe some of the articles that broke really early on…I had one come out Alert Diver which had tips on how to do it and I think people might get the wrong impression that I was the father of blackwater. Which you know that's not the truth. There's other people that have done it before me. Henley Spiers: Do you know when it started? Henley Spiers: It's amazing, it's an unbelievable experience. Can you see what the future of black water diving might be? Mike Bartick: Well I know what I hope for blackwater diving. I've joked about this “oh we should start a PADI course and get people Blackwater diver certified!” just as a joke. But you know that's going to happen. It's going to happen, these agencies agencies will start doing that. That's one thing. Yeah the other is I really want to see people try this all over the world in different types of water. I have had posts in the forum from freshwater lakes. I want to see that. There's this huge thing going right before our eyes. Right off the shore every night. You know you have these things like David Attenborough says "the largest migration of animals on the planet". And I want to see some of that and I encourage people to get out there and try it. So I hope that as time goes we'll see people coming online from all over the place. I'm getting emails from everywhere, people in Mexico and the Caribbean, Europe, Australia and just different places who want to try it. And so I encourage them and…We'll see what happens. Mike Bartick: Yeah and we do that. I actually have a group coming up for blackwater and several others after that. But it’s that kind of thing where you know you could be the average Joe and get struck by lightning and it changes your life. So for an average diver, photographer, you spend a lot of time shooting hairy frog fish (which I love by the way) and rhinopias. (which I love by the way! )…My point is you can dive thousands of thousands of dives in a location, like I have in Anilao, and then one night you turn away from the reef and explore the bays and the water around the area that you've been diving and discover something completely different. And from that moment it changes everything and all you need is one good subject and you're hooked. For me it was a wunderpuss, I shot the first larval wunderpuss back in I think 2014.
Henley Spiers: You shot the first one? Mike Bartick: Yeah the first one to photograph that. Yeah, right here in Anilao. And the reason why I saw that was because of my guide, Edgar. He showed it to me. He found it once, came found me, took me back and showed it to me again. Henley Spiers: I can't even find something after checking my viewfinder for a second! Mike Bartick: Yeah it's pretty pretty amazing. You know have to give credit where credit's due on that. I probably would have never seen that subject if it wasn't for him. I had no idea what it was so I sent it to some friends at the California Academy of Science. And they identified it as a settling wunderpuss. So that was the first time I ever heard that: settling. What's that? So I bought a book (I love natural history of animals and marine life), so I bought a book on octopus and read the different life cycles of different octopus and discovered: “Wow you mean octopus don't suddenly appear on the sand? !” that they start in the open ocean. So slowly we started to look away from the reef, into the water and that was really the catalyst of my desire to kick away from the reef. Henley Spiers: Blackwater is insane. It's amazing. Mike Bartick: Yeah it really is and you know that's the whole thing, it is about the experience, just being in the open ocean at night and having that experience of seeing what the lights are going to bring in. You just never know what you're going to see. You never know, one night it can be red hot , the next night nothing. Henley Spiers: It's the ultimate treasure hunt. Mike Bartick: Yeah it is. Henley Spiers: You talked about one mentor earlier. Could you give us a bit of background around who are your biggest mentors or perhaps influences? Photographers that you really looked up to as you were working your way up through the ranks? Mike Bartick: Well, like I said, I had gotten published a couple of times and I really thought I was something! I really thought “wow I'm on my way” and you know… And there was pretty stiff competition amongst me and my buddies in Orange County. We all had our Olympus 50 50s. I got a D70. I was shooting the shooting Canon, and I just got a D70, got published. So all these things are happening at one time and then I was at a dive club and there's this guy there with his son, and they were showing a video and photos of a trip that they're on and I was like “wow these are really special!”. So I talked to him after the club meeting. His name is Joe Liburdi. I forget the exact words. Basically I told him: “I feel like I've progressed as far as I can on my own and could he help me? Could he spend some time with me and give me some pointers and help me out?”. And He's really nice. You know he gave me his phone number and said to come over and that started out to be our friendship…Mentorship. Henley Spiers: And he was the biggest photography mentor influence in your career? Mike Bartick: Yeah. Before that the only name in underwater photography I knew of was David Doubilet. That was it. And then you get different names trickling in from the side…Ernie Brooks, Brooks Institute...because I used to dive in Northern California several times a week I'd drive up there. You'd hear names from there…but at that time there was really no household names. There was no way. You know the internet has made that possible. Henley Spiers: And when you look around at the scene today. Which photographers today do you find their imagery to be most exciting and inspiring? Mike Bartick: Honestly I find most photographers to be…Well, I don't know how to put this… delicately. You know there's photographers that rise above. But you know I can tell you honestly and this is really the truth. From doing workshops, I get all different levels of shooters, from newbies to people that are winning contests and or published and you just never know who's going to walk through the door. Because some of the new guys have really really good ideas but they just don't have the skill set yet, but they're forward thinking. And some of these old shooters, been around a long time, can be stuck in a rut. So when you work from both ends of that I think to myself “well I've been shooting for a long time, I don't want to be stuck in a rut. I want to try something different” which is really what I try. I mean I love photographers. I try to be willing to try anything. New guys come in and they're always trying goofy stuff. They want to be the next big shooter and they're like one hit wonders. So I kind of see those guys too. I'm like “okay this is great”. So for me I see it from both ends now. As far as looking outside of that, into the real world, I look at guys like Alex Mustard because he's so solid. And the reason why I really like Alex per se is because he also has a willingness to share which I like. I really feel that for me to share something with somebody else, and to see them take the skills that I've worked with them to develop, and then to use those skills and build on them. Build up like my mentor did with me, that's really nice. It's really a beautiful thing. And then it's not just using the skills but it's developing. It's like being a chef. I trained so many people how to cook. And after a while you have to let it go and just let them do their thing. And then you're watching and you're like “wow this is really special!”. So it's nice to see people come through the door that have an eye, and then it's even better to see and really pursue it and develop that into something that's really special. And I love that. Henley Spiers: Without having met all of these shooters, say for the people who are reading or listening to this. Are there any tips, advice that you would give to people who are not only wanting to get into underwater photography but thrive within it? Any advice that you would really want to share and pass on to them. Mike Bartick: Yeah make sure that you're always having fun. Really as soon as your attitude changes it's time to find a different hobby. And shoot for yourself. Very important to shoot for yourself. And try to better your own skills, not by comparing yourself to somebody else but by challenging yourself to do better. Henley Spiers: That's Good advice. Mike, It's been an absolute pleasure. Thank you very much. 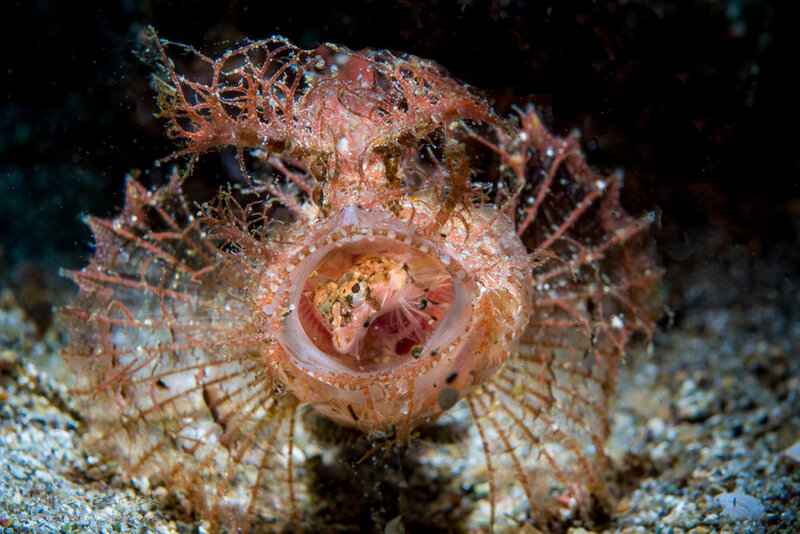 To see more of Mike’s images check out his website, follow him on Instagram @divecbr, check out the Blackwater Photo Group on Facebook, or better yet, pay him a visit in Anilao at Crystal Blue Resort.